This ergonomic Folding Bath Seat wins “best of category” for its practicality, sturdiness and comfort! This bath seat provides extreme security and all of its features have been designed with your well-being in mind: choice of 7 height adjustments, angled leg tips for better bathtub grip and a flex-comfort backrest to ensure a safe and relaxing bathing experience. This ergonomically designed folding bath seat fits most bathtubs. It provides support for individuals who need to sit down while having a bath or a shower. It is designed with your safety and comfort in mind. The seat itself has numerous small holes in it to let the water drain properly and to help you to stop from slipping off. It Folds! Easy to store. “ Nice for my land lady, she can’t stand up to have a bath as know she can sit down to have a bath. “ I have seen other bath seats in the past that were too large and cumbersome to move or store. When I saw this AquaSense seat, I grabbed it immediately, since this is the style and size that I was looking for. I’m very pleased that a company has finally decided to look beyond functionality (although it is necessary) and are able to combine it with style and convenience for the user. Thank you. “ I live in a Special Care Home. I am very pleased with this product. “ ery compact and easy accesibility. Looks good, with soap dishes, good idea. “ I am very happy with the AquaSense Folding Bath Seat, it make me feel safe when its time for me to have a bath. “ Very comfortable product and handy for showering much easier than I thought it would be. “ The soap caddies were cracked when I received my chair order from Wal-Mart, but these were replaced by mail when I called your toll-free number. Thank you for your service! “ I had to rent one previous to my back surgery which left me with a lot of numbness in the legs so having the back on this one was a plus….tks. “ This seat seems very sturdy. Other seats I had were very bendable. The criss-cross screwed-in legs of my other seat bent and a couple of times almost collapsed. because I have osteoprosis I could have been injured for life. This seat seems so much sturdier. I love it!!!! The seats with the screwed-on legs weaken after so long and lose their ability to be tightened. This seat seems so much sturdier. I love it!!! “ very compact, fits between the vanity and the toilet. In addition, it folds out for use easily as well. Great product would recommend to others for sure. 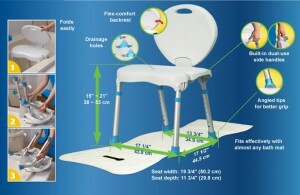 “ Very compact folding bath seat and easy accesibility. Looks good, with soap dishes, good idea. “ Light but sturdy, easy to transport. “ We appreciate things that geared to the elderly. We feel more comfortable having a shower now. Thank-you very much. “ Very comfortable and handy for showering much easier than I thought it would be. “ This little chair has met all the requirements on needs in a bath stool and then some. At first I was skeptical because of the folding features but bought it because of the price. It is the best bath chair I have ever owned for the money. The folding of the chair makes it easy for transport when I am going to go spend the weekend with family or friends. I can always have a bath stool when I need one! “ Life Saver! Although I hesitated to spend the money, this chair has been a life-saver while my leg is in a cast. It feels very stable and secure. Having a back rest really makes a huge difference. “ Very effective shower chair. Nice chair, fits in tub, easy to assemble, very sturdy, does not slide, sits well. I use this product to assist my elderly mother with her showers. Hey, sounds like a winner to me! I highly recommend this shower chair! “ This seat makes it possible for me to take a shower–at a time when otherwise, I wouldn’t be physically able to do so. This is very important to me. “ Nice folding bath seat for my land lady, she can’t stand up to have a bath as know she can sit down to have a bath. “ The colour is not what mattered it is the preformance of the product and how easy the bath/shower would be for me a I have no breath and now I can still do it for myself without help from another person. That is what matters for me. “ If I had had the choice of what to buy I would have chosen this folding bath seat as it is very safe and secure and I feel comfortable with it. “ I live in a Special Care Home. I am very pleased with the folding bath seat. “ A veru useful and necessary item. “ Already own one in Toronto, Ontario. “ The soap caddies were cracked when I received my chair order from Wal-Mart, but these were replaced by mail when I called your folding bath seat toll-free number. Thank you for your service! “ I am very pleased with the product I have purchased. I really enjoy the bath bench and it really helps with having a shower. “ I truly like this bath chair; due to the folding chair and the adjustable heights. “ Very helpful product If seat had a front opening like a toilet seat it would be more helpful for washing and rinsing for people who must remain seated during bathing. “ This folding bath seat seems very sturdy. Other seats I had were very bendable. The criss-cross screwed-in legs bent and a couple of times almost collapsed. because I have osteoprosis I could have been injured for life. The seats with the screwed-on legs weaken after so long and lose their ability to be tightened. This seat seems so much sturdier. I love it!!! !